The Poblenou Beach 13 apartment (HUTB-003698) is located in the Poblenou district of Barcelona, just 5 minutes walking from Barcelona’s beaches. 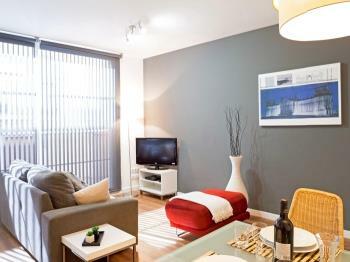 The apartment comes with a double bedroom which is spacious and light. The living area is a generous size. 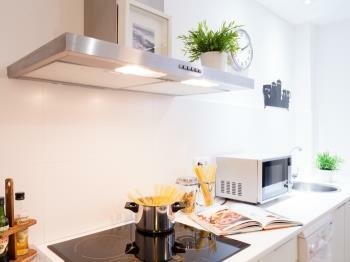 The kitchen is part of the same space and is fully equipped. 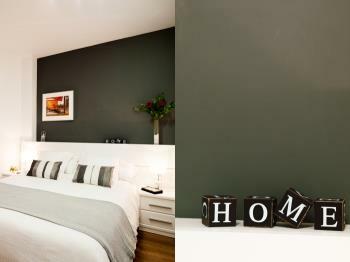 There is a double sofa bed in this same room, so the apartment offers accommodation for up to 4 people. 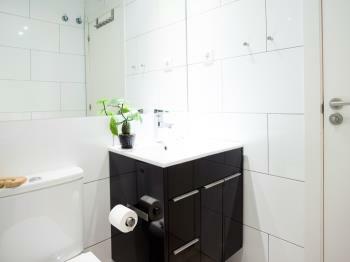 Finally, the bathroom is modern and spacious, with a walk in shower. 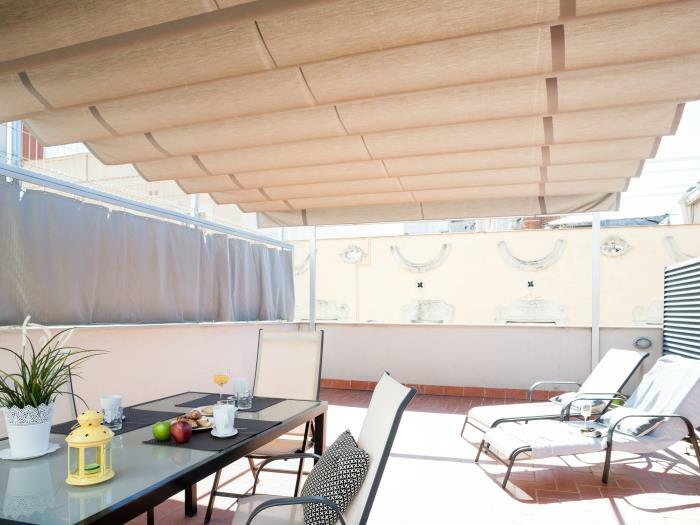 But the real beauty of this apartment lies in its gorgeous private roof terrace, 40 square meter terrace, accessed from within the apartment, provided with sunbeds, table, chairs and a parasol. IMPORTANT: We offer more apartments in the same building. These have either one or two bedrooms. 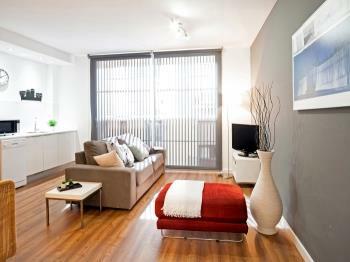 This modern apartment (HUTB-003698) is fully equipped with the necessary for your stay in Barcelona. It is a new construction building with elevator and well isolated from noise. A distribution corridor welcomes you in and leads you to a luminous living room where you will have acces to a private fully equiped kitchen, a table with a set of chairs and a couch. The TV is in this area. This is a fabulous space where you can relax, share, plan your visit to the city or enjoy your favorite food. 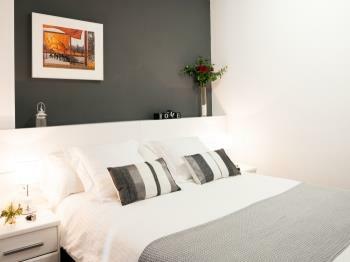 The double room has a comfortable queen size bed and a built-in wardrobe to keep in all your belongings. High quality sheets and towels are provided. 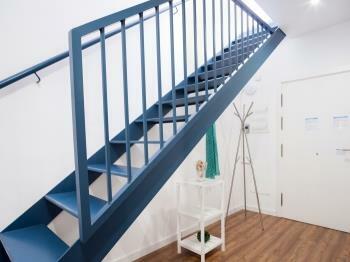 Private stairs inside the apartment lead you to a spacious private terrace where you will be happy either to start your day having an energizing breakfast under the morning gentle sun or to have a drink at the evening after a long day of discovering Barcelona. There is a sunbathing space. The building has elevator, parking (paying) and a common terrace on the top. IMPORTANT: In the same building we have other apartments for rent. You will be by your own at the apartment. However, our offices are very close. Do not hesitate to ask us whatever you will need. We can suggest you activities or book tickets for you: we will do our best to full fit your requests. This apartment located in the hearth of Poblenou neighborhood will allow you to discover the local culture. Safety and quiet area. 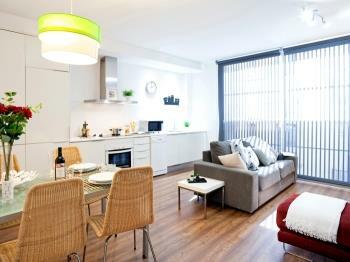 You can get fresh food in the popular market, sit in a terrace bar while the daily life of the area surrounds you. In addition, the apartment is only 5 min walking to one of the coolest beaches in Barcelona: Mar bella (means beautiful sea). If you are travelling for business proposes, this property may interest you if your destination is the 22@ area or the CCIB. The metro will leave you in the city center in 10min.The metro line L4 covers the main areas of touristic interest. If you are traveling by car, you can book a parking slot located in the same building for an extra fee. One set of linen and towels is provided at the beginning of the stay. We will offer you a basic welcome pack of basic products. You can easily acquire the rest that you may need in the shops available nearby if you wish. 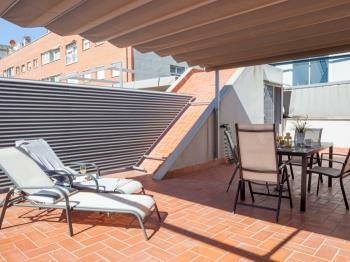 Just 5 minutes from the beach, this modern apartment is perfect to feel at home in Barcelona. 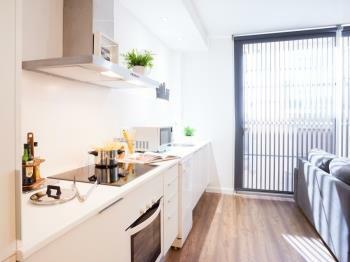 The kitchen is located in the open concept central space and is equipped with modern appliances and cooking utensils. 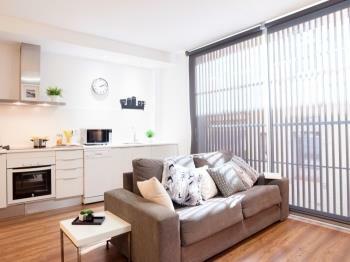 In the same space there is a dining table with chairs and a comfortable sofa bed. There is also a satellite TV and a DVD player. 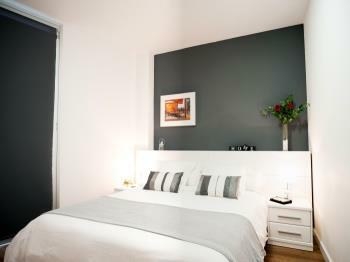 The room has a double bed, a large wardrobe where you can store your belongings and also has natural light. 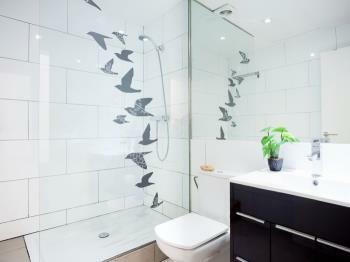 In the bathroom, where natural light also comes in, there is a large shower. There is hair dryer. 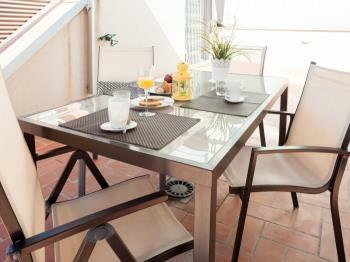 Staying in this apartment you can use the terrace exclusively, where you can access by stairs located inside the apartment. 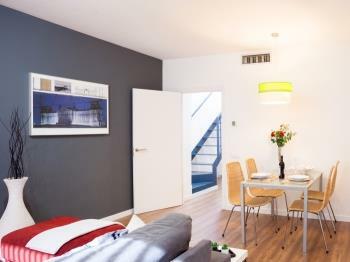 You will have Internet access for free WiFi, air conditioning and heating in all rooms.